It is estimated that 1 in 5 people in the United States have some form of arthritis1. Arthritis is the inflammation of a joint, or the junction where two bones meet. Osteoarthritis (OA) is the most common form of arthritis and is characterized by the breakdown of cartilage which serves to cushion the bones during impact and facilitate smooth motion. While the cause of OA is often unkownm there are risk factors that may increase the likelyhood of developing OA. Xrays are used to show the extend of the damage to the joint. 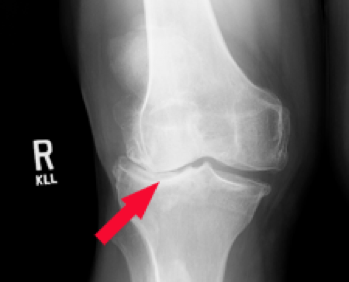 The narrowing of the space between bones (as shown by the red arrow in figure 2) is clear evidence of advanced osteoarthritis. Joint replacement surgery is typically done to improve joint mobility, eliminate pain, and improve quality of life. The procedure generally involves removing the damaged portion of the bone and replacing it with implants made of metal and plastic. These implants are typically held in place with a surgical cement or with a textured implant substrate that allows bone to grow into and hold the implants in place. Within 24 hours of your surgery, you will begin walking with the aid of an assisting device such as a walker or crutches. Your physical therapist will teach you the safest methods for getting in and out of bed or a chair and up and down stairs. He or she will also ask about your living environment to develop an exercise plan that prepares you for your return home. At this point, you may no longer need to use an assisting device such as a walker or crutches. Your physical therapist will give you a series of exercises to do at home. If you are consistent with your physical therapy, you should be able to resume activities such as returning to work, driving, shopping, housekeeping, and intimate relations (when you feel comfortable). You can enjoy a variety of low-impact activities such as swimming, walking, golfing, bicycling, and ballroom dancing (check with your doctor or physical therapist). Avoid high-impact sports such as running, aerobics, and contact sports, as they can cause damage to the artificial joint. 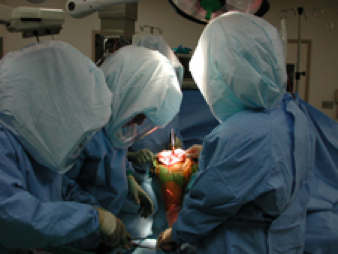 One of the potential complications of joint replacement surgery is infection. To help reduce the risk of future infection, people with joint replacements are often instructed to take antibiotics when undergoing medical or dental procedures, including simple teeth cleanings. These routine precautions will be required for up to several years after the surgery to reduce the risk of infection. Another potential complication, Deep Vein Thrombosis (DVT), occurs when blood in the large veins of the leg forms a clot which could potentially travel to the lungs and restrict blood supply to a portion of the lung. This is called Pulmonary Embolism. There are many ways to reduce the risk of DVT, but probably the most effective is getting you moving as soon as possible after surgery.